Do you fancy eating a cobbler? It can be a good dessert or a snack for your kids to enjoy! It is quite tasty for sure you would love munching this delicious dessert and that will make your mouth water. 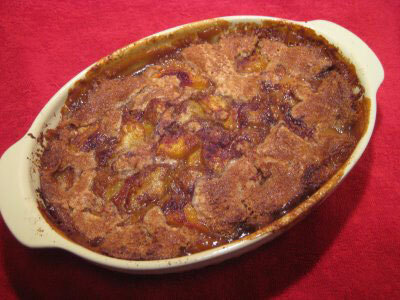 There are different sorts of cobbler, whether it is made up of cherries, apples, blueberries or peaches. But in this recipe, it will be more of peach cobbler. The colour is more of summer like and best of all it blends well with other flavours too. Peach is really one of the best fruits you can use when making your very own version of cobbler. Prepare the 6 pieces of peaches and peel them all. Then, start slicing the peaches. Put them on a bowl and let them sit for couple of minutes. A trick when peeling peaches is to put the fruits into a boiling water and let them sit there for one minute only. Afterwards, plunge all the peaches right into a bowl of cold water. The skin will immediately slip off. Then, add at least 3/4 cup of sugar and mix it with the peaches. For the butter, this is the easiest one. Combine the following: baking powder, sugar, salt, flour, and milk. Stir the mixture all together. Get a baking dish with a size of 9×13. Melt the butter right into the baking dish. Put the baking dish inside the oven and pre-heat to a temperature of 350 degrees. The moment the butter melts, you will be done preparing the peaches plus the batter. Start putting the slices of peaches unto the baking dish and it starts to fill up. Get the batter and pour it on top of the peaches. Never attempt to stir it. Put it back to the oven at a temperature of 350 degrees. Let it cook for about 40-50 minutes. Until such time the batter will turn into golden brown colour. You will see some cracks found on the surface. Serve it while it is still hot and add whipped cream to the cobbler. This will melt slowly into the fruit. Yum!